There is nothing worse than the fear of opening the mobile phone bill to find the efforts of excess consumption embedded within the final figure of the monthly Invoice….most of us can admit to being in that situation as well. The increase in smartphone use in the country along with the content that can be viewed on these devices plus the lack of generosity in regards to plan allowances by most of the big phone providers in the country has spurred on more of it than ever in the last 5 years…but an Australian bred group with the backing of big investors like Lachlan Murdoch is hoping to change this. Unlockd is offering providers and consumers the idea of being able to incentivise the mobile phone experience by providing discounts or bonuses on mobile phone plans through the use of advertising. 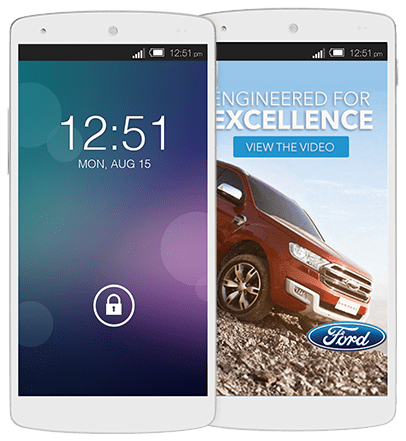 Providers interested in the concept sign up with Unlockd to provide the system through a custom branded application that is downloaded to the users mobile phone, which serves advertising every 3rd screen unlock. At present the system is currently only available on the Android operating system and currently signed up in Australia is Lebara Mobile, powered by the Vodafone network. Under the Lebara Plus plan offering an extra 2GB of data to those users who opt in to receive the advertising program. Unlockd is looking to gain a market in Australia & the USA at this stage, but if the idea is a success here I can see more countries coming on board.